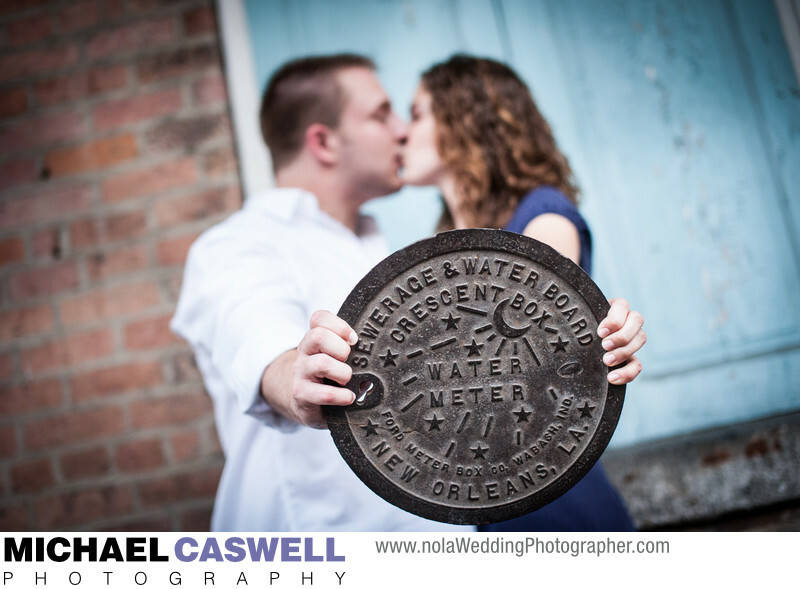 These unique and mysteriously-decorated water meter covers are a New Orleans icon. For weddings, I frequently see this design being used for groom's cakes, and other decorative elements. One wish that this couple had for their engagement portrait was this picture, of them holding one of these famous items. The problem is, these covers are highly coveted souvenirs, and thus are frequently the target of theft. As a result, they are very often locked down, or even welded shut, so we also considered some alternate possibilities, including perhaps having them lay down on the sidewalk next to one of these. But by some miracle, we actually managed to find one that was unsecured so that we could capture this photograph. Amusingly, as we were shooting, a French Quarter resident was walking by, observed what we were doing, and pointedly asked, "are you STEALING that?!?" It took quite a bit of effort to convince her that our intentions were completely innocent and benign, and indeed, after we were done we left it just where we had found it.